There are no large coronal holes on the Earth-facing side of the Sun today. Credit: NOAA GOES-13. Did you sleep through the auroras of November? Next time get a wake-up call: Spaceweather PHONE. PLANETARY ALIGNMENT: Mark your calendar. On Dec. 8th though 11th, the planets Jupiter, Mercury and Mars will converge, forming a tight triangle in the early-morning sky. All three planets will fit together in the field of view of ordinary binoculars. Don't miss it! Sky maps: Dec. 8, 9, 10, 11. 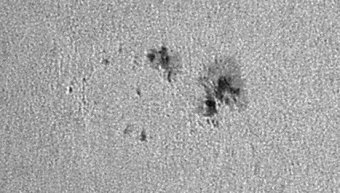 Sunspot 927 on Nov. 29th. Credit: John Nassr of the Philippines. The fast-changing spot remains an inviting target for backyard solar telescopes. Rapid changes could lead to magnetic instabilities and eruptions. Stay tuned. The scene repeated itself in Maryland and Virginia. It was not only complex and beautiful, but also remarkably widespread. 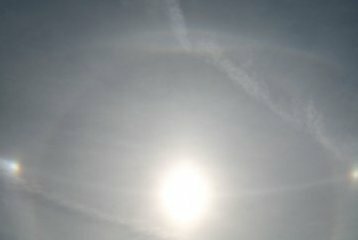 "Outstanding halo displays need high quality ice crystals specially aligned in the sky," explains atmospheric optics expert Les Cowley. "This display has it all: random, plate, column, the rare Parry and the extremely rare and controversial Lowitz aligned crystals were present." "Lowitz arcs were first sketched in 1790 but until even a few years ago, scientists doubted their existence. Now, thanks to digital cameras and the Internet, skywatching is popular and each year brings several Lowitz sightings. Have you seen your Lowitz arc yet? Check the simulation and search for them."